The scammer places an ad on Craiglist, looking for a photographer to photograph an event. The ad is appealing, offering an easy job and high pay. A real photographer responds and they engage in a quick negotiation and get things going. The scammer sends the photographer a cheque as pre-payment. The cheque is for more than the agreed value (overpay). 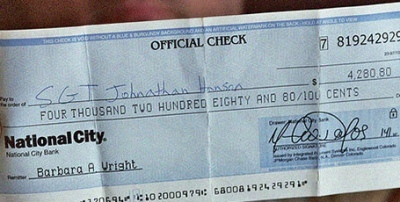 The cheque is counterfeit. The photographer banks the cheque. The photographer makes out a new cheque to return the balance and posts the new cheque to the scammer. The bank tells the photographer that the cheque bounced. By then it’s too late. Thanks for the quick response and I’m sorry if my message came in late , i have been busy with other arrangements and i hope you understand .Its really nice reading from you and im glad to hear that you are available for my wedding . I want you to know that this is a inside wedding and the order of events will mail to you a week before the wedding day but the order events is likely to be pictures first, then the wedding ceremony , and then the reception but let me discuss this with my lady because is our wedding so our two has to make the decision together . I hope you understand my point of view. I want you to know that we will be taking formal pictures so i will like you to recommend 45minutes or an hour set aside for taking formal pictures because we have large family from both my side and the bride side and friends /co-workers we will want to take pictures with . So it will be easier if we can take the pictures before the ceremony because it will be more relaxed with fewer time constraints and would like you to set up a great “first look” shot of me looking at my bride for the first time on the wedding day. Basically we need your service starting from 12pm to 6pm . We are expecting 250 guests i.e 200 adults and 50 children . And also there will be a table place set for you at the reception , so you don’t need to bring your own food but it will be nice if you can just give me an hint of what kind of food you want us to arrange for you i.e if you are vegetarian or eat all kind of foods . Further more , there will be special important parts/people at the ceremony or reception that i would want you to take a picture of .I will send the list of the important parts/people to you a week before the wedding day and i want you to know that my wedding is a sleek modern wedding . I need you to get back to me with your charges and i will be paying you upfront , I just called my uncle who will be in charge of your service fees he told me that your payment will be paid to you via certified check so he has asked me to ask for your full name and physical address with zip code that you want the payment to be send to so as for me to secure your service for my wedding party. I’m currently on working on off shore and im using impaired device ,so therefore i can only send message via internet or send you an sms from my pinger ..
Will be expecting to read back from you with the details I have asked for thanks so much and God bless. What can we learn from this? Maybe not to return any money until the cheque clears. And to be vigilant of similar scams. If you know any event photographers you might want to let them know about the scam. There’s more information here.